Fitbit has given its biggest rival Apple a head start of over two years on smartwatches. It is now just catching up. The leader in the wearable devices market hopes the Fitbit Ionic is the product that will increase interest in its overall brand and a category in tech that has lost appeal. The smartwatch with a space theme is $300 which is $30 more than the Apple Watch starting price, it main competitor. The price is high to ask of customers who might already have a smartwatch or are hesitant to invest in their first one. However, the watch has everything one would expect from a smart device for fitness including activity and sleeping tracking, a heart monitor, GPS integration, long battery life and smart notifications. The battery lasts as many as four days, in comparison to just 18 hours in Apple Watches. The Ionic is waterproof with other additions for the fitness fanatic. A sensor will measure the oxygen level in the blood as well as personalize workouts adapted to feedback. The Ionic is the first product by Fitbit with hardware as well as software, the Fitbit OS that is designed in house. The member of the design department at Fitbit said the device was inspired by a space journey and the progressive thinking that helps you reach a destination. The Ionic has lightweight aluminum casing and colored glass touchscreen. 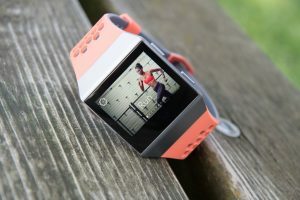 Fitbit was working on a smartwatch before, known as the Fitbit Blaze, but James Park the Fitbit CEO said previously that the category did not make sense for his company as smartwatches lacked a purpose, but opinions at Fitbit have been changed. Park said Fitbit was not entering the smartwatch category just to enter, for us he added, there is a purpose. The company has a strong feeling that the smartwatch is a platform that we can deliver our most powerful tools this market has seen to date. However, Fitbit is far behind. Smartwatches as a market is $10 billion in size, and it is expected that figure will double over the next four years. However, shipments of wearables were down in 2016 compared to 2015. Experts have the opinion that this category will see a surge once the smartwatches break away from smartphones. The Ionic, similar to the Apple Watch, requires a sync from a neighboring smartphone. However, Fitbit is planning to launch a new version in 2018 that does not require a sync. Revised GDP for Second Quarter Up 3% in U.S.